Administrators can set up Facebook or LINE channels to better support your users. For these channels, you can add multiple pages or accounts as different profiles. This section will discuss how to add and edit channels and profiles in Message. If you would like to add your LINE accounts, you will need to perform additional steps described in Adding LINE. Note: For LINE and Facebook channels, it is recommended to limit your profiles to five each. In Message, you can easily add channels in the Active conversations or Done conversations pages. Click the dropdown menu next to All Channels. Click Setup next to the channel you would like to add. Enter your credentials and follow the instructions provided by the channel. Note: LINE requires additional steps. See Adding LINE. In Message, click the Admin icon. Select either the LINE or the Facebook channel. Click the Add profile or Add account, then proceed with the channel's instructions. For information on LINE, see Adding LINE. In Message, you cannot make changes to a channel overall and instead must edit individual profiles. To unlink a channel from your Message account, you must delete every individual profile. Select the channel and profile you want to edit. You can also use the Responders and Integrations tabs to edit Auto Responders, operating hours, and bot handover. See Setting up Auto Responders, Setting up operating hours, and Setting up bot handover. When editing the profile, click the Delete button at the bottom of the Profile tab. To connect your LINE account to Message requires additional steps both in Message and LINE. This section will instruct you on how to prepare your LINE account to connect with Message and a more detailed explanation of the setup steps in Message. Navigate to the LINE developers portal (LINE Developer). Click the Messaging API button. Enter your LINE account credentials. If you have not created a LINE account yet, please consult the LINE documentation for instructions. If you created a new account, you will need to confirm your credentials, then click Register. On the left sidebar, select a provider or click Add new provider. Note: If you are creating a new provider, you will need to enter additional information for the provider, then select the provider again. You will be redirected to the Channel settings page. Under Message Settings>Use webhooks, click the pencil icon. Select Enabled, then click Update. In Message, navigate to Admin>LINE, then click the Add account button. A pop-up window will open containing instructions for connecting your LINE account. Enter or enable the information required in the Message instructions. You can click Next in the pop-up window to proceed onto the next step. Channel Access Token: Underneath Messaging settings, click the Issue button. Channel Secret: Underneath Basic information, click the Issue button. Webhook URL: Underneath Basic information, click the pencil icon. Paste the URL from Message and update. Allow Webhooks: You should have already have allowed webhooks under Basic information. See the previous steps for instructions. Click Finish when you have completed all the Message instructions. After you finish inputting this information, your LINE and Message account will be connected. 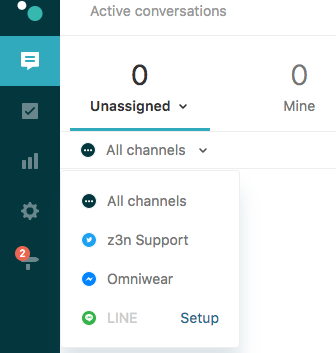 As part of today's Zendesk Message release, we actually start to allow multiple profiles to be connected to a single page. 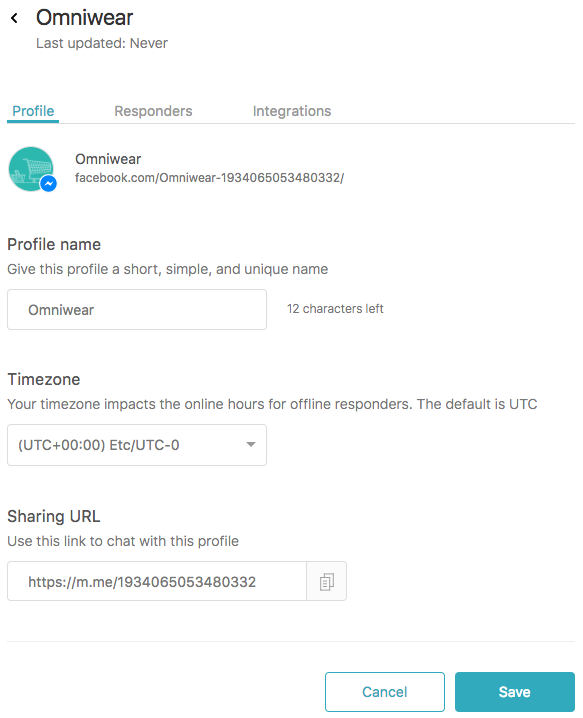 You can now connect up to 5 Facebook profiles to a single Zendesk Message page. Is there a clear way in the message to tell what page/brand they are contacting from? My team supports multiple brands, so knowing the brand is important. That is indeed something we are working on right now. You can probably expect to see this improvement land in the coming months! If you add Instagram support it would be great, and an fb "Like" button in the zendesk message replay area like the rating button will be great too. Thanks for the feedback! Instagram is certainly a channel of interest, however they do not have a messaging API right now. Can you explain a little what you mean by a like button? Are you referring to the button which sends a thumbs up when pressed like in messenger? Would like to ask for your help. I have completed the LINE@ setup and my Zendesk message is able to receive chat from end users. But, when I tried to reply our end-user does not receive the reply. Please advice on this issue. Why do you think that users aren't receiving the reply? Is it because they're not responding? Have you done any internal testing by submitting a chat yourself from an incognito window to try to duplicate the issue? I tried to link zendesk with my LINE@ bot but it seems that the message comes true only for the case of 1:1 chat. When we add the bot to group chat. It cannot recognize the message in the group. Is there any possibility to let the bot interact within group? Have you referenced our documentation on setting up bot handover, detailed here? I don't believe there is a restriction to group conversations. Can you also confirm if you are utilizing our Conversation API, or are you using a separate api, such as that of Line?